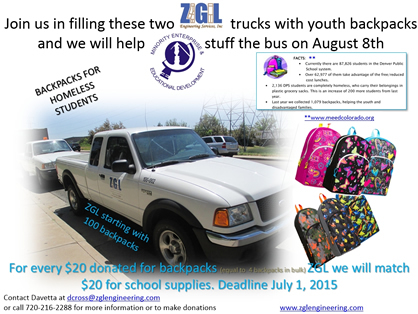 Backpacks - ZGL Engineering Service, Inc.
ZGL Engineering has chosen to partner again with the Minority Enterprise & Educational Development, Inc., (MEED). MEED collects new and gently used backpacks, and school supplies to distribute to homeless students in the fall. 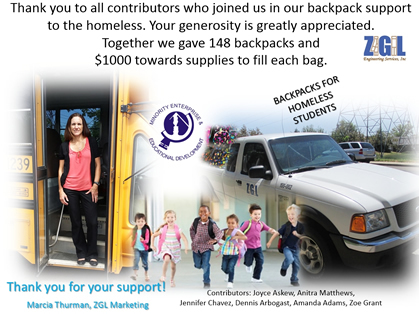 We were proud to be part of the 2014 contributors of the MEED's Annual Backpack/School Supply Program and to provide 148 out of the 1015 new backpacks and an additional $1000 for supplies. We are asking that all donations reach us by July 20th this year so we make necessary arrangements to distribution. Thank you to all of last year's contributors, you all made an awesome statement in the community. Help us make an impact. Donate Today!